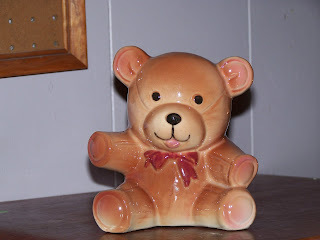 Can you identify this cute bear planter for me? It's not McCoy! 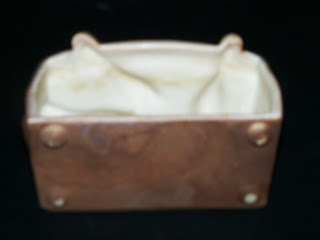 This items is to be added to my page for sale...l00.00...white interior is not a common color for the sports line planters. The Society has new Officers as of January 1st and I'm really excited about that. You can check them out on the 'contacts' page of the Society Website. These are folks who will work together for the good of the Society and help it grow. 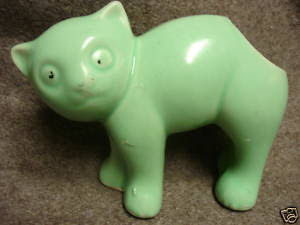 Because McCoy did make stretch animals, sellers 'assume' the cats they find are McCoys...but They're NOT! McCoy did not make stretch cats! 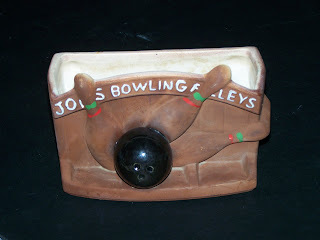 If you're into McCoy Pottery and are not a Member of our Society, Check us Out! To help my webmaster out, I can post things here easily and not bother him to insert my "Dibs and Dabs" of infomation I want to share. I've collected McCoy for many years and like to share the knowledge I've gained with those who are interested. I need to empty some shelves so if you see something on my for sale page that you're intersted in, write, I'll make a deal if I can. A lot of my collection was bought when prices were really high...thus some things I can't cut much...but let me know if there's anything there you're intersted in!